Thieves stole a £1.2 million Strad and tried to sell it for £100. | LEARN TO PLAY THE VIOLIN FOR FREE! A gang of thieves who stole a £1.2 million Stradivarius violin from an internationally acclaimed musician tried to sell it for just £100, a court heard yesterday. 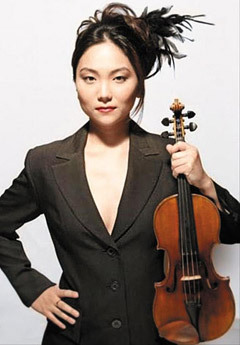 The South Korean-born Min-Jin Kym, 32, began playing the violin at the age of six. Irish traveller John Maughan snatched the 313-year-old instrument from South Korean-born violinist Min-Jin Kym as she stopped to buy a sandwich at London’s Euston railway station. Despite researching the violin online, Maughan, 40, and his two teenage accomplices were so ignorant of its value that they offered it to a stranger in an internet café for just £100. But the man turned down the offer claiming that his daughter already owned a recorder, Blackfriars Crown Court was told. Maughan and the two accomplices, aged 14 and 16, were arrested four weeks later following an appeal on Crimewatch and yesterday admitted a single charge of theft. However, the violin – one of only 450 in the world – has never been found and insurers are offering a £15,000 reward for its return. via Thieves offered to sell £1.2 million Stradivarius violin for £100, court told – Telegraph.